"The SNP manifesto for the Scottish Parliament election does not promise a second independence referendum within the next five year term. However, it says Holyrood should have the right to hold another referendum if there is "clear and sustained evidence" of majority support for independence, or if there is a "significant and material" change in circumstances, such as Scotland being taken out of the EU against its will". 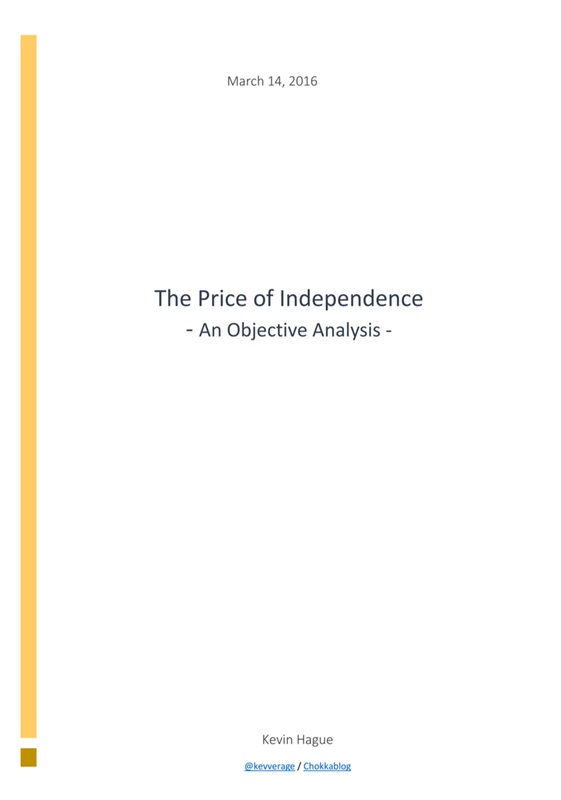 "Instead the manifesto states the SNP reserves the right to stage another referendum if there is “clear and sustained evidence” that a majority of Scots support independence or there is a “significant and material change” such as Britain leaving the EU." "Unlike its clear pledge to stage one in the 2011 Holyrood manifesto, it does not commit the SNP to stage a referendum in this parliament: instead, it says one could be held if there is a material change in Scotland’s circumstances, such as vote to leave the EU against the wishes of Scottish voters"
"Nicola Sturgeon: Brexit vote would 'almost certainly' trigger second independence referendum"
I could go on but it is clear there was absolutely no secret about this. All fair points and credit to people like yourself who spend many hours researching putting right the 'fake news'. Personally, I'd go a step further. The SNP's white paper for indy1 is categorically clear that "Scotland being dragged out of the EU against its will" was a risk. Yet the No vote prevailed and the No vote was pretty categorical. Therefore when Scotland voted in indy1, it accepted this risk, and accepted that constitutional matters were reserved to Westminster. On this basis a Scottish vote in a UK referendum carries the same weight as an English, Welsh, or Northern Irish vote. There is no 'material change in circumstances'. The risk of Brexit was ground that was already fought in indy1. Interestingly is Scotland was a Europhile as the SNP tries to present, Brexit wouldn't have happened. 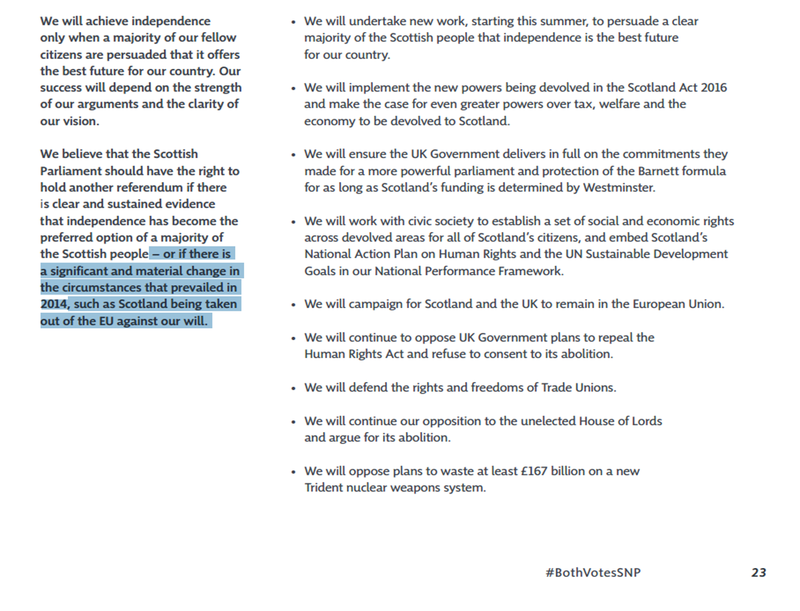 What about the more glaring absence of permission from the ScotGP manifesto for that party to support the motion next week? Also a stretch to say that two parties representing <50% of the vote in the 2016 elections are synonymous with "Scotland". I remember when David Torrance lauded you as a blogger. This blog is helping me to understand why, as like Torrance you start from your conclusion and work your way back. As an analyst, I am sure you know that’s not how it is supposed to work. I might have said your conclusion was “SNP BAD BAD BAD”, but it’s much worse than that now, is it not Mr Hague. I accused someone of your turn of mind on the Herald forum today, of living in his own laager. You could contemplate that as well. Your wagons are beginning to form a circle, aren’t they? First of all, you take Sturgeon up on a single quote during a TV debate, that she would be looking for a majority who wanted a referendum. OK, fair enough we could both make a case for yes or no, but even if my case came out on top it would not be much of a majority. But the problem for your argument is that Sturgeon is not seeking a referendum this week, next week, next month, not even this year. The fact is that all she is looking for is a section 30 order which would then require another version of the Edinburgh Agreement (which last time, btw, did not make any use of the word “generation”). When she is suggesting a referendum is after the Brexit negotiations will be finished and the Article 50 process has moved on to confirmation by member states. The view of the EU – and it’s hard to say that it’s not sensible (though I am sure you will try) – is that negotiation needs to be completed in 18 months, and the confirmation process requires 6 months. In short Kev while its fine to take politicians up on not following through on manifesto commitments, you also need to take into account the practicalities of events. But none of that deters you, does it? The fact that it appears only on “the left-hand side of page 23” is used against them. Really, it’s all a bit pathetic, even a bit childish is it not? Kevin,You may not have said anything that is untrue, but you haven't told the whole truth. How many voters read manifestos - easy read or otherwise? It is disingenuous now to try & rewrite history in an attempt to delegitimise the SNP's call for a referendum. I have to admit to my shame that I have never read a political manifesto. Although I do suspect that I am in a majority of voters on this. Having said that, I always understood that the SNP's primary policy is independence and I think all Scottish voters understand that too. I've not heard of even one instance of someone not realising that the SNP is for the breakup of the UK. I do feel very strongly that the referendum should be re-run. If I had known that a hard Brexit was coming I certainly would not have voted No to independence. EU membership was a very important part of the Better Together prospectus. Not that I blame Better Together for that: nobody would have predicted that a hard Brexit was coming, the polls clearly showed the Conservatives were going to lose the coming election, the polls showed the UK would vote to Remain and at the time Ukip was advocating that the UK adopt a Norway-style position. I think we have to accept that they technically have a mandate (as you do). Whether or not they should act on it is the real question, morally and democratically I think they are on dubious ground in that area given all previous rhetoric. It will really help the case for independence a Brexit outcome is a poor one. One way to shift events in that direction is to cause as much distraction and mischief and grievence as possible during a time when UK least needs it. The fact a poor Brexit outcome will also injure the interests of any independent Scotland is transcended by the fanatical pursuit of this goal by the single issue politics ruling over the people of Scotland at this time, authored by the SNP. I'm not suggesting we ignore the manifesto. I think we're all agreed there was a manifesto commitment. The argument is about how well known to the people of Scotland the SNP's commitment was. My view is that it was very clear that the SNP are a party whose primary aim is independence. Even for someone like me who doesn't live and breath politics it was more than clear that was their position. Frankly, if unionist voters are voting for the SNP without realising that they are in favour of independence then I think they've only got themselves to blame. 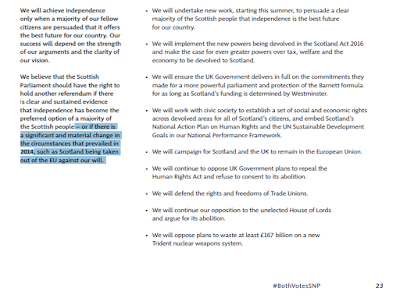 I'm in full agreement with your thoughts on the vagueness of The SNP's manifesto pledge. Typical SNP want the power to do something but don't actually want to commit to doing it. In response to one of the other posters I'd like to point out that until it has been negotiated, AND signed off by all EU members we have no idea what kind of brexit we will have. The SNP will continue to try and spook voters by refering to 'hardest of hard brexits' but in truth they have no idea what the EU and Westminster will agree to at the moment. Just now May has signalled her willingness to walk away with no deal, which far from meaning that is her intention it is arguably just marking out the parameters of a negotiating position. We need to wait and see what is actually agreed before getting upset or pleased. Furthermore, if there really is a 'hard brexit' where almost nothing is agreed and thus causing a multitude of trade barriers to spring up between the UK and Europe then it would frankly be madness to then drag Scotland out of the UK and into Europe, why would any sane person want to see such barriers impeding 64% of our trade rather than just 15%? I suspect senior SNP staff are well aware of that, but of course, don't tell the voters that we might be better off sticking with the UK outside of Europe if there's a hard brexit, they might wonder why you are making such a fuss. The SNP wording in their manifesto gives them the right to call for an Indy2 Ref but I don't consider this to be a mandate for them to do so. They need to couple this right with a clear indication that the majority of Scots actually want another referendum. The latter requirement has, in the past, been frequently stated by the FM. As there is no demonstrable case that the majority of Scots want another referendum, there is no justification for Indy2 Ref. A question on whether or not another referendum is supported could be included in the coming local council elections on 4th May. Turnout is unusually low but would still give a better indication than what is currently available. These are quotes from Nicola Sturgeon made during the 2014 referendum campaign. Note the lack of any caveats. "constitutional referenda are once-in-a-generation events"
We won't stop believing in independence if that's what you're asking me. Would there be another referendum in our lifetimes? We've always said its a once-in-a-generation thing. Kevin, have you seen the Aberdeen paper reporting that the Alex Salmond can easily be demonstrated to be lying about "once in a lifetime"? Yes, the SNP is playing a bit fast and loose with its manifesto commitments, and it's fair to call them out on it, but in the larger scheme of things I don't think it's a very productive issue to pursue. SNP leader Nicola Sturgeon today admitted she does not know what currency an independent Scotland would use, how its economy would function or how it would engage with the EU. Speaking less than a week after calling for a second referendum on Scottish independence, Sturgeon conceded that her party was currently unable to provide answers to key questions. I loved your recent tweet "when blind assertion meets actual data "
is this related to you failure to publish my most recent reply on here? Although we clearly disagree on the best way forwards for Scotland, I didn't have you down as someone who would run away from honest debate. Life is full of disappointments, eh? Seems that the massive increase in SNP votes cast at last election are being discounted. D`Hondt voting system curtailed what would have possibly been another tsunami in the Scottish Parliament As well as the 56 MP`s in the House Of Commons.59 Constituency seats in Holyrood to 7 for their nearest challenger. If election had been fptp we would probably be witnessing a near obliteration of Labour and Tories in Scotland.Allied to that all areas of Scotland voted to remain in the EU. How much more of a mandate does a government need ? I've seen this comment made repeatedly, but no-one seems prepared to answer it. How does anyone know for certain that the Scots voted 62% to stay in the EU. As I recall the question in the referendum was should the UK leave the EU. Should Scotland leave the EU was never asked. Kevin, I had posted a further response, but it is perfectly possible that i had clicked the wrong button or not proved I wasn't a robot or something. So apologies - I was surprised when you didn't post it - because that's not your style - so I'm sorry for the accusatory tone to my earlier post. Sadly (?) - I didn't save it & I cant be bothered doing the groundwork again. Suffice to say, I provided some more evidence that the SNP's intention was clear - from various interviews & debates - it's mentioned in the debate from which you have extracted a 15 second clip. It also featured in one of the other TV debates as well as in a TV interview with (I think) Gordon Brewer. My overall point is that the SNP's position that a Brexit vote against the votes of the Scottish electorate could be a mandate for a second indyref was clearly public knowledge. There was no attempt to hide it. When is a democratic mandate not a democratic mandate? When the Unionist don't like it. Not only was it in the 2016 manifesto it was widely discussed in the media. Comparing it to the Amazon small-print is an act of desperation. Why don't the Unionists just accept that we should have the vote? They're going to walk it anyway, they tell us, and nobody is seriously suggesting that governing Scotland was conducted any less effectively during the last campaign. Or are we going to hear more of the same rubbish that we heard from Anas Sarwar on Tuesday along the lines of "I oppose a referendum because I believe in democracy." I think there is possibly a growing chunk of the Scottish population are getting fed up of this debate, including a lot of No and Yes voters. I get that emotions are running high on both sides and I think all 4 political parties are guilty of trying to exploit the calls for a second referendum for their own political advantage. While the SNP are the chief instigators of a 2nd referendum, the tribalism and whataboutery on both sides needs to at least dial it down a few notches. I think there is space for a non-aligned political party on the constitution in Scotland, similar to that of the Alliance party in Northern Ireland. I had hoped the Lib Dems would fill this position but sadly they too seem to insist on putting the constitution front and centre of their speeches and debates. Could I reply to Steward Dredges' question "Why don't the Unionists just accept that we should have the vote? " (1) because we voted on this matter in 2014 having been told that it would settle the matter for a generation. (2) because it means more years of Holyrood not getting anything done as independence uses up all the political oxygen. (3) because re-running it damages the Scottish economy by heaping uncertainty on investment decisions. See this nice and unambiguous survey of 800 Scottish SMEs. Could I reply to anonymous, please? 1) We did vote on this matter in 2014 but now, after Brexit, the situation has entirely changed.The SNP, unlike any other UK political party (including UKIP!) anticipated this and had the foresight to write it into their 2016 manifesto. There was nothing on my ballot paper in 2014 about "once in a generation." I did not vote for that and neither did anyone else. 2) there is no such thing as "political oxygen." People can't just make up daft concepts to win a political argument. 3)If changing economic direction is always a bad thing we could never make any progress. If, under Westminster rule, the country which has been Europe's biggest oil producer for the last 50 years has been so badly mismanaged that it is now "a bigger economic basket case than Greece" then that alone is an overwhelming argument against the status quo. But companies survive because they learn to deal with the status quo. It becomes the environment with which they are familiar and in which they feel safe. But it is not necessarily the best environment for the nation and its people. If Scotland's is a failing economy why should we pander to those who survive in it and don't want it to change? If these companies can only survive on massive hand-outs from England, as we're told they do, why should Scots be content with that? I'm sorry but I'm deeply suspicious of those who tell us "we've ruined your economy to such an extent that you can't afford to be independent any more so you'll just have to continue being subsidy junkies!"